It is a little village high in the Hargita Mountains of Transylvania where the winters are long and harsh. It lies up the road about 20km from Csíkszereda (Miercurea Ciuc) where Hockey is a religion. A favorite story from last winter in the NYT was illustrated with this photo from the winningest Romanian hockey team. The grin on this gap-toothed fan, proudly wearing the team jersey never fails to make me smile. Quoting the Times article. 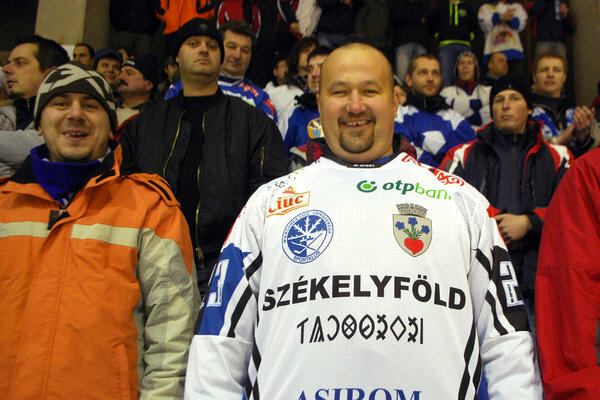 “the name on the front of the team’s blue-and-white hockey jerseys is not Miercurea Ciuc. It is Szekelyfold, the Hungarian word for the Szekely Land a former province of the Kingdom of Hungary. Printed on the ice at the Vakar Lajos rink is the Hungarian name of the team: Hoki Sport Club Csikszereda. The fans at the team’s home games chant the Székely Land anthem in Hungarian.”. 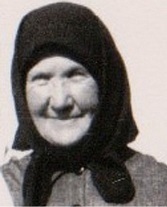 Those Székelys (pronounced say-kay) are a fiercely proud people. Defending their drop-dead gorgeous, inhospitable, rugged mountainous region for centuries, they are the most Hungarian of Hungarians cut off by distance and politics from their brethren further west. This is the homeland of my mother’s family, farmers and warriors for generations. Smart, proud and educated, the young people today go to university in the Saxon city of Cluj in north-western Transylvania and return home to the beautiful mountains where their families have always lived. A special seasonal feature in Word-Press (the platform for this website) is the falling snow that adorns the site through the holiday season. I thought a good winter story was needed to complete the picture. I have not been to Transylvania in the winter. I really don’t like the cold. But I love to look at the pictures from a warm distance. This entry was posted in Csíkkarcfalva, Erdély/Székelyfőld, Orbán and tagged Csíkszereda, Hargita mountains, Hockey, Winter by edesorban. Bookmark the permalink.